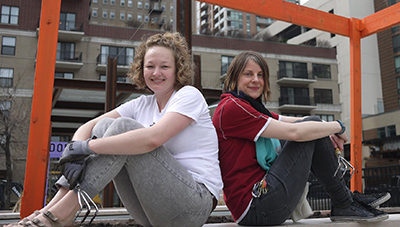 Faculty member Melissa Potter and her and collaborator, CBPA alumna Maggie Puckett, planted in the Seeds InService bed on Friday in the Papermaker’s Garden. Seeds InService: A Papermaking Institute is an initiative by both artists explore the intersections of the art of hand papermaking with gardening, social practice, community engagement, and creative pedagogy in The Papermaker’s Garden. 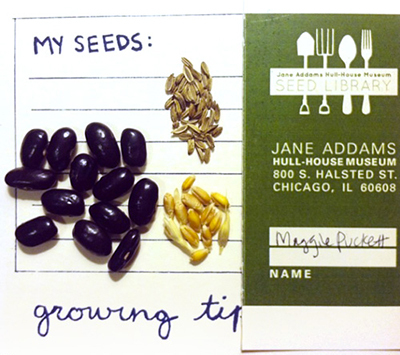 By planting heirloom vegetables and flowers also usable for papermaking fiber from the Hull House Seed Library, this project honors the legacy of Jane Addams, a Nobel Prize winner, and underrepresented American historical figure who founded The Hull House in 1889. Domestic and culinary crafts were central to Addams’ radical social reformism. Many of the immigrants who came at the turn of the 20th Century were puzzled by their new non-native plants and animals, and were too poor to buy good quality food. Today, most Chicagoans have the same lack of information about sustainable food practices.